Manual entry - Customers can be created and edited one-by-one directly within Brightpearl. It is also possible to make batch updates to various details on existing customer records. 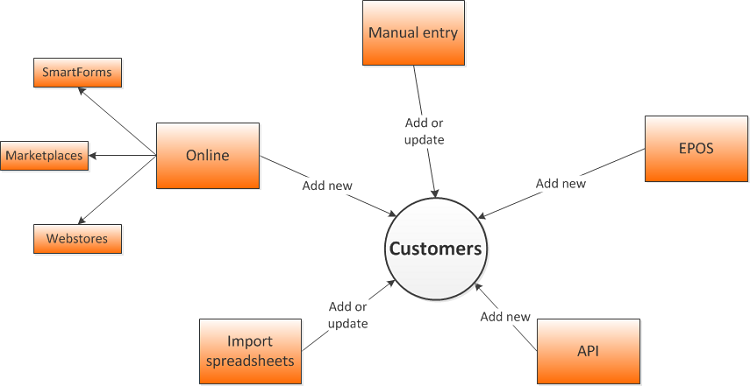 Imported by spreadsheet - New customers can be created or existing contacts can be updated by importing a spreadsheet. New customer records can also be created when orders are imported from a spreadsheet. Online - Customers are created when orders download from integrated sales channels. SmartForms - SmartForms, such as an enquiry form, can be embedded into a website for capturing customer details, this will create a contact record in Brightpearl. EPOS - Customers can be manually added through EPOS. API - Customers can be created over our API. View, add and change contact information for the customer, such as email addresses and phone numbers. The trade status is useful for reporting on whether your customers are Retail or Trade customers. You can assign a contact owner (staff member) for example, if a particular sales person or account manager owns this customers. The contact status is useful for managing where the customer is in the sales pipeline, allowing you assign reminder days to be prompted to contact the customer in the future. The lead source helps you monitor where you're customers are coming from and therefore which marketing campaigns have been most effective. The "receive newsletter" setting is important for ensuring customers are not contacted when they don't wish to be. You can set urgent messages for contacts which will appear when placing an order for them or whenever the contact is viewed or payment is taken. Multiple addresses can be recorded on each customer record. Once the two available blocks have been entered and saved, another block will become available. Continue to enter address details and save to add even more. Addresses can be set as used for different purposes. This is where financial information is recorded for the customer such as the price list the use, tax code, currency and nominal code for recording sales revenue. It's possible to assign the customer credit terms and limits and blanket discount as well as record their bank details. Custom fields are used for creating additional fields on customer records. These are useful for storing more information which can be used for searching and reporting. This is where you can see a full chronological history of activity on the customer account. Entries will often provide a link to the related documentation in Brightpearl, such as sales orders or emails. Each entry is color coded to help you find the information you need. Displayed only when Helpdesk is activated. This is where you can view open tickets created by/for the customer through the Helpdesk module. You can upload files to customer records in order to keep a record of external documents, such as emails or scanned images. Attach the files here and see them listed for future reference. Displayed only where multiple customers exist with the same company name. Each colleague is listed along with their role and email address (if recorded). It is possible to add multiple addresses against a single customer or supplier record. Only two address blocks are available to use by default, but once they have been filled in and the customer record is saved a new block will become available. Activities - This is where you will see any outstanding or due tasks relating to this contact, including calls, follow-ups, events, meetings and things to do. Open Sales & Quotes - A summary of any open orders or quotes, you can easily click to open one or to view their full order history. Financials - This box displays the total outstanding account balance and the credit limit, use the links to view a full financial history, record a payment or view/send a statement. Go to Customers > New Customer. You should use the customers route for any contact that isn't a supplier. Enter the contacts company and name details at the top. Notice on the right-hand side the system looks for any matching records that already exist. If a match is found you can click on it to go to that record instead. Work your way through the tabs completing as much information as you need. In the Info tab enter there contact details, try to get email addresses if you want to use marketing campaigns. You can change the contact between a customer, supplier or employee here, as well as assigning a Lead source, Contact owner and Status. Use the Address tab to record the contacts addresses. Make sure you specify when an address is used (i.e. billing/invoicing or delivery). Setting a Default address is used as the customer's primary address. You can add more addresses if you need to, just save the contact each time and more address fields will appear! The Financial tab allows you to store information that will be used when entering accounts transactions for this contact, for credit control and so on. The Custom fields tab is used for any extra information you might want to store for this contact. Save your contact. The Timeline, Tickets and Files tabs will be displayed. You can begin viewing information here as it's collected. To run a batch process view your customer or supplier lists and apply filters as desired. Tick the checkbox next to any contact to be processed. Use the -More- drop-down menu and the buttons to select the required operation. Go to Settings > Contacts > Contact defaults.